This stove pipe elbow makes a 90? turn in your vent pipe. It is made from 24-gauge steel and is corrugated to make it strong. It requires an 18" clearance to combustible materials in the finished installation. You should deduct 1 1/2" from its actual length when you are calculating its installed length. 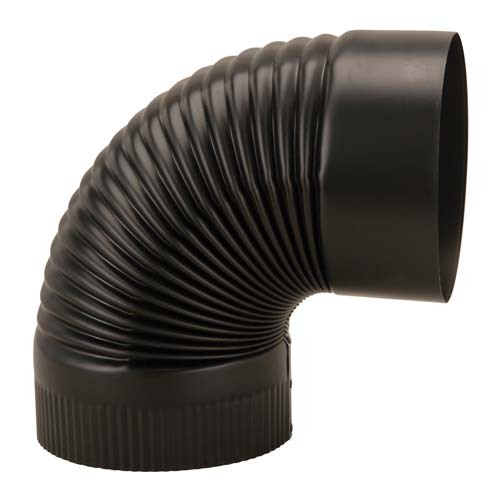 The part is available in sizes of 6" and 8" to match most stove pipe diameters. It carries a one-year manufacturer's warranty. Can I get this in a 45-degree? Unfortunately, this is not available in 45 degrees. The stove pipe elbows arrived within 5 days. They were perfect. I will order from you again.